Welcome to another installment of WHAT'S ON NETFLIX?, where we pick out a film or series currently playing on Netflix and review it for the fans. This week's selection is the animated film...THE SECRET LIFE OF PETS. After his success with Despicable Me and Despicable Me 2 (seriously, who doesn’t love Minions just a little bit? ), Chris Renaud is back at again with Universal Pictures, and this time he is joined by an all-star cast featuring Louis C.K., Kevin Hart, Eric Stonestreet, and Jenny Slate. This buddy comedy is set in New York and proves to be a fun watch for all ages. When The Secret Life of Pets premiered this past summer I had several friends go and watch it without me. Upon their return from the theater I was told that the movie was terrible and shouldn’t be watched. This was confusing to me because it was getting pretty good reviews, so when it came new to Netflix recently I had to investigate for myself. I’ll start by saying that the opening 10 minutes is a short film in and of itself. It’s quick, has a fun and sharp bite, and makes you remember a special pet in your life. We are introduced to our protagonist Max (C.K.) and his benevolent and overly attached owner Katie (Kemper). 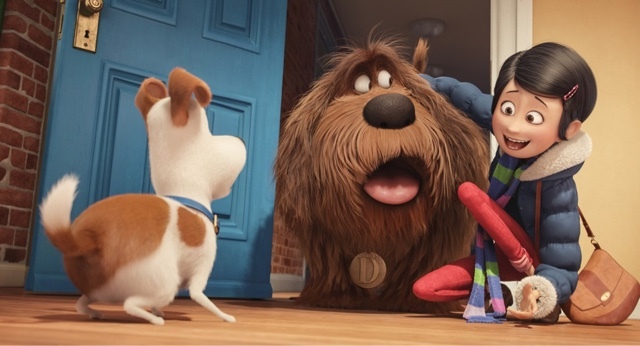 I told my fiancee as we were watching it, “That dog is Petey and your dad.” Honestly, the entirety of the film doesn’t match the opening sequence, but it’s still entertaining. From there we are faced with a familiar problem in being replaced as the only child, as Katie brings home a new dog name Duke (Stonestreet) that threatens Max’s place as the beloved dog of the house. What ensues is a mix of hilarity, strangeness, and some feels. After fighting and ending up stranded on the streets and on the run from a deranged bunny named Snowball (Hart), Max and Duke struggle through the sewers and streets of New York City to get home while Max’s secret admirer Gidget (Slate) forms a team of unlikely heroes to find them. I found this film enjoyable as it reminded me of other buddy comedies like Pineapple Express (2008). After my viewing I couldn't understand why my friends didn’t like it. I thought that there was enough plot to keep it interesting and funny in a relatable way that made me actually laugh aloud at spots, and emotional enough to have a response. The Secret Life of Pets will entertain adults and kids alike, so turn on Netflix and have some family time—you won’t be disappointed. Labels: Chris Renaud, Eric Stonestreet, Illumination Studios, Kevin Hart, Louis C.K., Movie Reviews, The Secret Life Of Pets, Universal Pictures, What's On Netflix?